Members of the Fritch family at the event. Claude Monet, Mary Cassatt, Edgar Degas and other famous artists shared a common health issue that affected and sometimes ended their careers -- cataracts. Cataracts, which are related to aging, cause the eye lens to cloud. If the lens is cloudy, the image seen will be blurred. 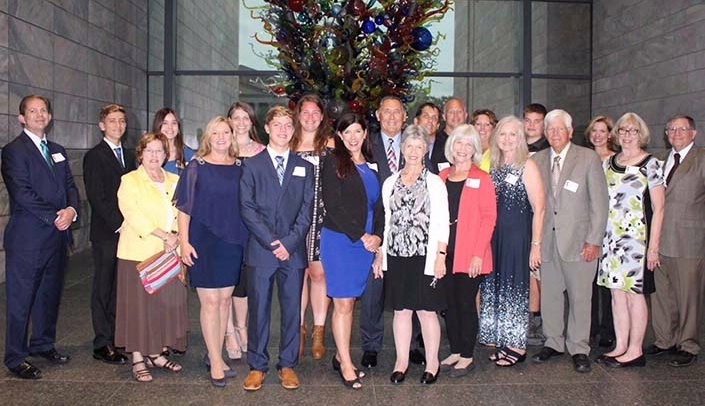 Last Friday, the family of Charles Fritch, M.D., and his wife, Judy, hosted an event at the Joslyn Art Museum to celebrate vision and the arts. The Fritches are benefactors of UNMC, the Stanley M. Truhlsen Eye Institute and the Fritch Surgical Center. The reception, gallery viewing, dinner and talk by Fritch family friend, James Ravin, M.D., was attended by family and friends, community members and UNMC guests. An ophthalmologist and internationally acclaimed historian on vision and the arts, Dr. Ravin talked about writings in some of his book, "The Artist's Eyes: Vision and the History of Art," which explores how eye disorders influenced the work of artists. Dr. Ravin said as Monet's vision worsened in his right eye, all he could see out of the eye was light. It became apparent in his paintings in light, color and forms. He said Monet would get frustrated and slash some of his paintings. He eventually had cataract surgery in his right eye. Dr. Fritch said the event was born out of wanting to have a celebration of vision and the arts. "I wanted to inspire people even though they may have vision problems, to see how wonderful art can lift you up," Dr. Fritch said. "It's a gift from God, a blessing we wanted to share. Vision problems affected art, but it didn't stop people from being great artists. "I also wanted people to come to visit and see the Joslyn. It's a jewel in the city and I wanted other people to come by and get a glimpse of what Omaha has to offer," he said. The event coincided with the annual Gifford-Truhlsen Conference through the UNMC Department of Ophthalmology and Visual Sciences. The conference provides a venue for presentations by residents, fellows, and alumni and honors three visiting professors, as either the Gifford, Truhlsen or Fritch Lecturer, in honor of the namesakes who've made a considerable impact on UNMC and the department.